Wie zerstört der militarisierte Polizeistaat das Nationalgefühl auf der Halbinsel? Lately, Sinai Peninsula has had relatively good media coverage since the militia of Ansar Beit Al-Maqdis announced loyalty to ISIL, and since the buffer zone between Egypt and Gaza started to be established. Breaking news from Sinai usually tells the audience about fires, bloods, battles between the Egyptian military and the armed groups. Language: English with Arabic summary. 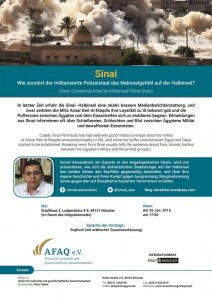 Ismail Alexandrani is an investigative Journalist specialized in Sinai affairs. He has previously worked as a Freelance Journalist, Video Journalist, and Assistant Producer for several websites, TV networks and news agencies, as well as a freelance Arabic Language Editor. 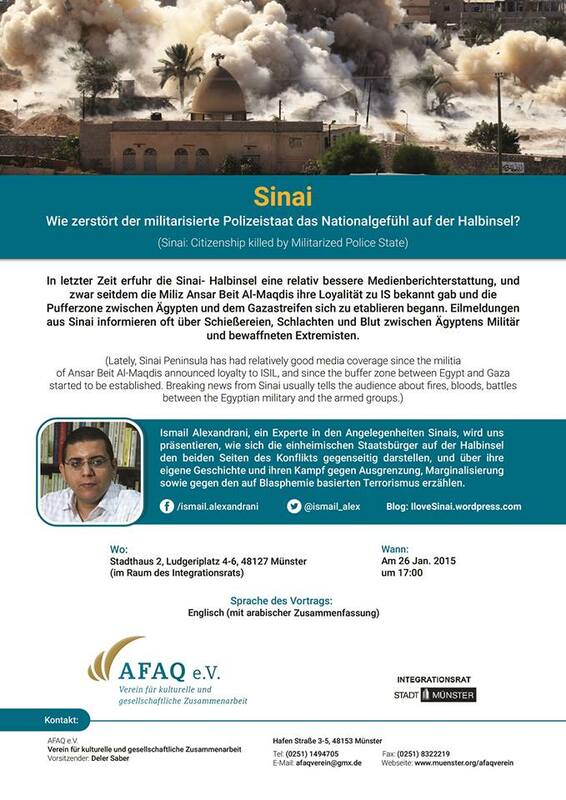 His social networks accounts on Facebook and Twitter, and his blog on Sinai, are considered references for local, national and international media, including the UN OCHA website on humanitarian news and analysis (IRIN). Alexandrani is a Fellow Researcher at the Arab Reform Initiative (ARI) (Paris), and Head of the Sinai Unit at the Egyptian Center for Economic and Social Rights (ECESR). 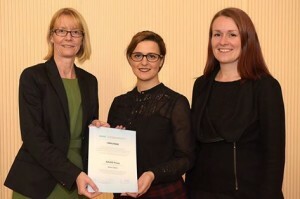 First prize winner of the Youth Global Essay Contest (2009), Alexandrani was also first prize winner of the National Competition for Spreading Mutual Understanding and Respect (2009). Alexandrani participated in several exchange and public diplomacy programs with both Eastern and Western European countries. He designed and led several training programs on capacity building for civic initiatives and institutions, campaigns and social media, networking, informal education, dialogue, peace and intercultural exchange, human rights awareness and he is accredited by the Jesuits Cultural Center in Alexandria and the Cairo Institute for Human Rights Studies. 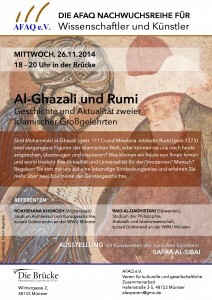 Sind Muhammad al-Ghazali (gest. 1111) und Mewlana Jelaladin Rumi (gest. 1273) zwei vergangene Figuren der islamischen Welt, oder können sie uns noch heute ansprechen, überzeugen und inspirieren? Was können wir heute von Ihnen lernen und worin besteht ihre Aktualität und Universalität für den “modernen” Mensch? Begeben Sie sich mit uns auf eine lebendige Entdeckungsreise und erfahren Sie mehr über zwei Edelsteine der Geistesgeschichte. 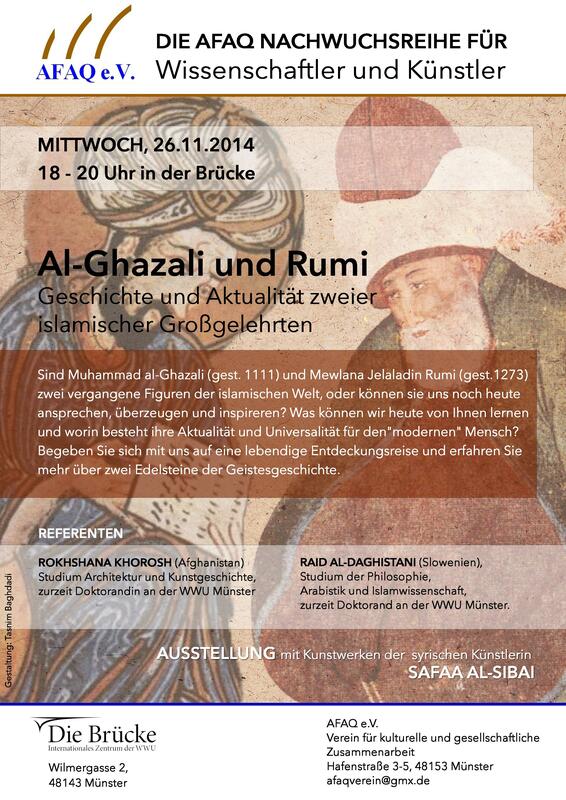 Dazu eine Ausstellung mit Kunstwerken der Künstlerin Safaa al-Sibai (Syrien).